Because, really, eating out on V-Day is a pretty amateur move. Photograph: Martha Williams Chicago pizza options include the Inferno pizza at Dante's Pizza. 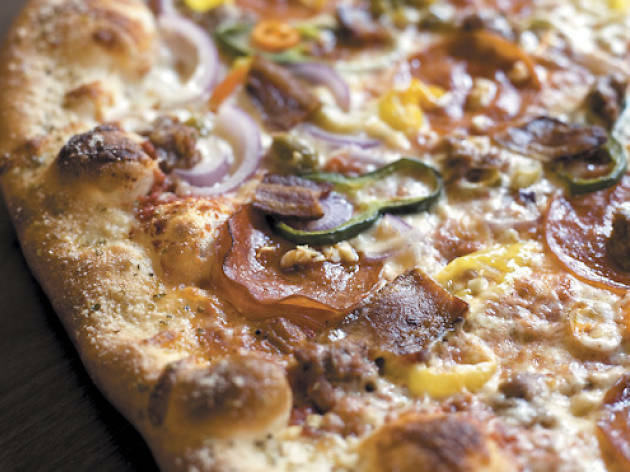 The Art of Pizza Don’t get us wrong; we love the fresh toppings, including meaty chunks of mild sausage and fresh vegetables that are crisp and crunchy when you bite into them. But it’s really the sauce—full of fresh tomato flavor, speckled with oregano, basil and the faintest hint of red pepper—that’s made this pizzeria an institution. Both the deep-dish and the (not very thin) thin-crust resist sogginess after a night in the fridge, making them the breakfast of champions. 3033 N Ashland Ave (773-327-5600). Lunch, dinner. Average pizza: $18. Dante’s Pizzeria Welcome to the “Nine Levels of Hell”: poblano peppers, pepperoni, giardiniera, bacon, fresh garlic, jalapeño, sausage, red onion and banana peppers, together forming the “Inferno.” This pizza sounds terrifying, but, trust us, it won’t hurt: The heat’s present but mild-mannered, the thin crust is pleasantly chewy and the thing is huge. The pizzas have more going for them than the bare room they’re served in, so do carryout or delivery, or resign yourself to the Tenth Level of Hell: eating greasy pizza on a paper plate while some kid bangs on a video game. 3028 W Armitage Ave (773-342-0002). Lunch, dinner. Average pizza: $25. Pie Hole Pizza Joint Sexual innuendo dominates the menu of this Boystown slice shop (which relocated to these digs in late 2010). Second to the sausage jokes: pizza, made to order by the slice or whole pie, and available for delivery from 5pm until midnight and in the store until 3am on the weekends. Suffice to say, this stuff was made for post-bar gorging. But the slightly bubbly crust and copious amounts of toppings make for fine eating when sober, too. 3477 N Broadway (773-525-8888). Lunch, dinner. Average pizza: $19. 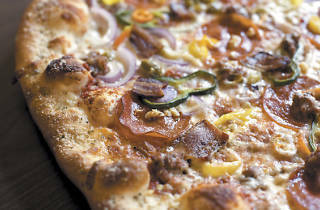 Roots Handmade Pizza The shtick at Roots is that it hawks pizza in the style of the Quad Cities—that is, pizza with malt in the crust that’s cut with scissors. Turns out the Quad Cities style can cross county lines and be successful (even if that malt tastes less malty and more sweet, and even if the signature topping essentially plops a taco salad on top of a pizza, shredded iceberg lettuce and all). Very fine housemade cheese sticks, crunchy salads and a comprehensive list of Midwestern beers make for a spot that is surprisingly high quality (especially when you consider the fratty atmosphere). 1924 W Chicago Ave (773-645-4949). Lunch, dinner. Average pizza: $20.